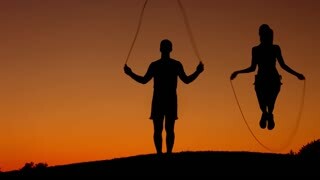 Guy smiles and jumps on a skipping rope. Guy engaged in fitness on a green meadow. Warm up outdoors. Happy beautiful young sportswoman smiling showing thumbs up holding jumping rope on green chromakey background crossfit sport motivation cardio exercising gym fitness athletics activity.